Microsoft Dynamics CRM customers and prospects can learn more about Microsoft Dynamics CRM at http://www.microsoft.com/en-us/dynamics/crm-vision.aspx. Microsoft Dynamics CRM partners can follow the launch at https://mbs.microsoft.com/partnersource/solutions/CRM/CRMLaunchPage.htm. 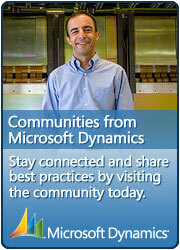 You can follow and engage with the Microsoft Dynamics CRM community @MSDynamicsCRM, http://www.twitter.com/msdynamicscrm. This entry was posted in Information, MS CRM and tagged 2013, Dynamics CRM 2013, MSCRM, News on July 2, 2013 by Rhett Clinton MVP.